So in Delhi travelling by metro is easy and safe, travelling by bus is the opposite. These buses are also known as killer-buses here, as they kill around three people a day. 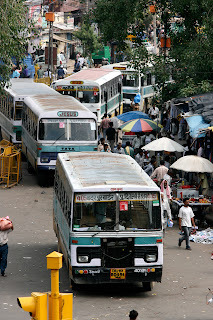 In Delhi there are several bus companies competing with each other so they try to carry their customers as quick as possible. So buses often don’t stop and people have to jump on and off the buses, what causes lot’s of accidents. Many people also die when being hit by a bus when they are performing dangerous and illegal overtaking maneuvers to be first at the destination. Unfortunately the metro does not reach all the places in Delhi. Right now they’ve finished just three lines. In case I wanna get back to my place which occurs at least once a day I need to change from metro to bus and from bus to rickshaw again which sounds easier than it is. First there are hardly any real signed bus stops. There are no route maps. And as a foreigner you’re not able to identify the destination the bus is going to. It is absolutely necessary to know the place where you want to go by name and ask, ask and ask… Once you have jumped on the driving bus you have to pay a little amount of 5 Rupies (10 Cents). Again I had to ask lot’s of people for the stop Anhand Bihar as there is no computer voice calling the next stop like in Europe. 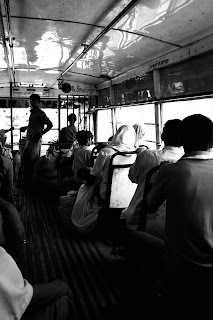 The buses themselves are really scratched and the ride is always a very shaking experience.